As the Career Center‘s Fall Career Expo and Fair wraps up, the next step in your journey of vocational discernment begins. For many students, the focus will shift to brushing up on interview skills and finding new ways to get involved on campus to gain new experiences. For other students, the Career Fair provided an opportunity to reflect on interests and identify potential career paths. Your brand is manifested in everything you do and everyone with whom you interact. A major part of your personal brand is your online presence, particularly with social media. Whether you realize it or not, the internet is one of the primary sources that employers use to look beyond the resume and cover letter to learn more about candidates. The decisions you make in your days at Notre Dame will directly influence your future. Just as you learn in the classroom, the decisions you make outside of the classroom (particularly in social settings) can have far reaching implications. What appears when you perform a Google search (or better yet, a Google image search) of your name? Is this brand reflective of the “true you”? Does your Facebook profile really need to be public? Is what you post on Facebook something that a potential employer would find appropriate? What impression would a potential employer have of you if they spent 5 minutes scrolling through your Twitter feed? Be smart; be thoughtful; and remember… you are responsible for developing and refining your personal brand. Two years ago, a review of student disciplinary procedures at Notre Dame began. Through the review, a few common themes were identified. We learned that myths and ghost stories of “Reslife” resulted in a skewed perception of the true purpose of Notre Dame’s student conduct process. We also learned that some of the most meaningful conversations and life changing experiences were a direct result of an experience with the Office of Residence Life and the student conduct process. As a result of the review, a number of refinements have been made to the administration of student conduct processes which take effect this semester. The most noticeable change is a transition from the Office of Residence Life to a new model with the Office of Community Standards. You may have noticed that we are no longer a verb. As an office within the Division of Student Affairs, we are committed to the holistic development and formation of all of our students. We do this by engaging students when their behavior has not aligned with the University’s standards of conduct. 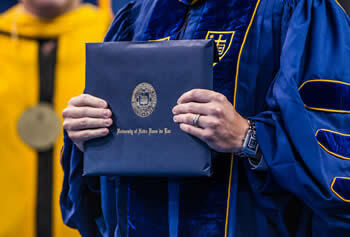 As we look for other ways to connect with the Notre Dame community, we invite you to follow us on Twitter and engage us through this blog platform. By engaging students through a variety of means, we hope they realize the value of our standards and how we each contribute to building community. After all, we are all ND. The Office of Community Standards endeavors to educate the Notre Dame community about our standards. In addition to managing du Lac: A Guide to Student Life, we are pleased to offer a thought-provoking series of reflections to develop “a sense of community and of responsibility that prepares students for subsequent leadership in building a society that is at once more human and more divine” (Notre Dame Mission Statement).